9 Sticking Points The House And Senate Have to Work Out In Their Tax Bills Now that the Senate has passed its own version of a tax bill, lawmakers have to iron out differences with the House bill. The final product could then be sent to the president to be signed into law. 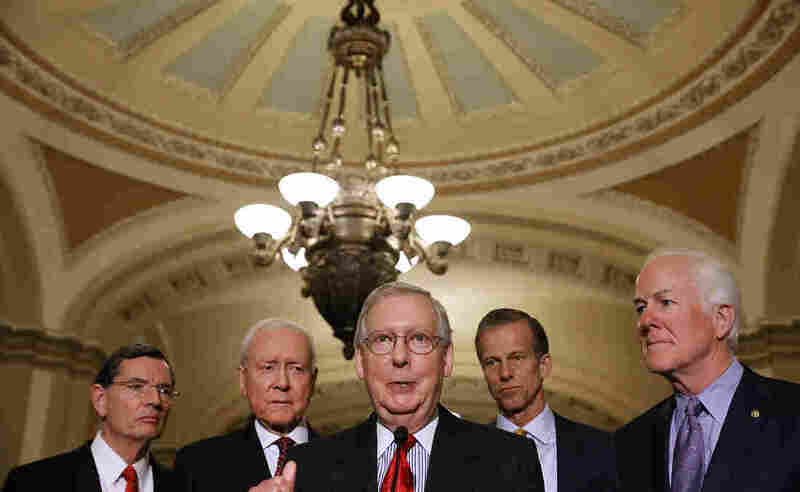 Senate Majority Leader Mitch McConnell, R-Ky. (center), gathered the support he needed on Friday to pass the GOP tax bill in the Senate. Now that legislation must be reconciled with the House version. House and Senate Republicans have now passed two different versions of a sweeping tax overhaul. Their next step is to iron out differences between the two bills, so the final product can be sent to the president to be signed into law. Both the House and Senate bills call for deep cuts in the corporate tax rate — from 35 to 20 percent. In the House version, that cut would take effect next year. In the Senate version, the lower rate would begin a year later. The two bills differ in a number of other ways, including their treatment of individual taxes and so-called "pass-through" businesses that are taxed at the individual rate of their owners. House: Sets up four tax brackets, with tax rates ranging from 12 to 39.6 percent. Senate: Seven brackets, ranging from 10 to 38.5 percent. Both versions offer a larger standard deduction while eliminating personal exemptions. But the individual tax cuts in the Senate bill expire after 2025, while those in the House version are permanent. House: Taxes pass-through businesses at a fixed rate of 25 percent. Senate: Taxes these businesses at the owners' individual rate, but allows owners to deduct 23 percent of their pass-through income. House: Boosts the child tax credit from $1,000 per child to $1,600. Senate: Increase it to $2,000, but the credit would expire after 2025. Both versions would make the credit available to more middle- and upper-income families. But those on the lower rungs of the income ladder might not see any benefit, because the "refundable" portion of the tax credit — which helps those who pay little or no income tax — is unchanged. House: Taxpayers could only deduct interest on mortgages up to $500,000 — down from the current ceiling of $1 million. Senate: Leaves the mortgage-interest deduction unchanged. The Alternative-Minimum Tax, or AMT, is designed to ensure that highly paid workers with a lot of deductions still pay at least a minimum amount of tax. House: Would do away with the AMT altogether. Senate: Fewer taxpayers would be subject to the AMT than are today. This is a tax on wealthy individuals' estates when they die. Currently, it applies to those whose estates are valued at $5.49 million. House: Does away with it altogether in 2024. Senate: Raises the threshold at which the tax is owed, so only the very richest families — with more than $11 million in assets — would be taxed. Only about 0.2 percent of estates ever face this tax. House: Does not deal with the Affordable Care Act's mandate, the tax penalty for people who don't buy health insurance. House: Treats graduate students' tuition waivers as taxable income. Senate: Does not address this. Both the House and Senate bills cut the corporate tax rate to 20 percent — which the White House had identified as a key goal. After the Senate vote, though, President Trump suggested there may be some wiggle room. "It could be 22 [percent] when it comes out, but it could also be 20," Trump told reporters on Saturday. "We'll see what ultimately comes out." A somewhat smaller cut in the corporate tax rate could give lawmakers breathing room to make other adjustments, while still staying within Senate rules that say the bill can add no more than $1.5 trillion in federal debt over the next decade.